As promised, here is the first in a series of case studies on specific games and their media presence. I have a couple of objectives with these case studies. First, I want to provide a sense of scale, by looking beyond the very top titles covered every month. There are a lot of very interesting games that have done very well in their PR endeavours, yet don’t necessarily come up in the monthly “top 15” I put together. These titles are better benchmarks for looking at the broader media landscape in games. These are titles that have been successful in their media outreach, they are on the high end of the benchmark, but provide a more “typical” example of coverage. Second, this is a great exercise to look at what kind of beats gain traction and how other games organise their communication campaigns. 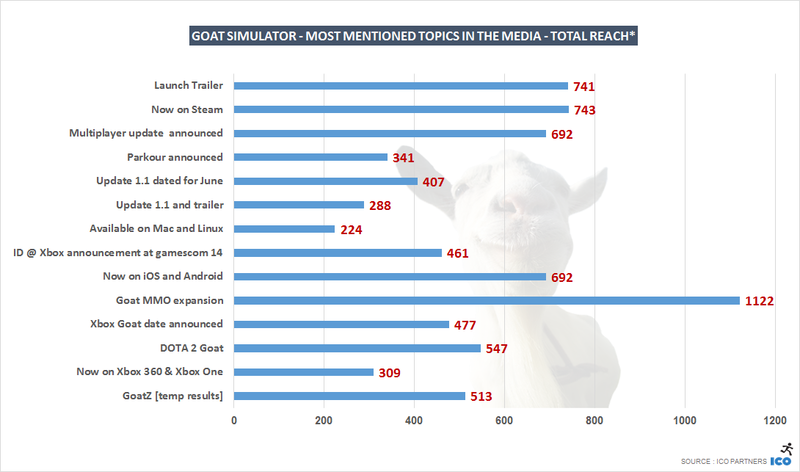 With Goat Simulator having recently announced its zombie DLC, this is a great opportunity to look at how the game has done in terms of media presence. We start from its Dead Island-inspired trailer through to the most recent announcements. I prepared this article just before GoatZ was revealed, so it isn’t in the below set of data. This timeline provides us with an excellent visualisation of each PR beat put out and its coverage. Clearly, the media presence for the game outside of these beats is very limited, but this is quite normal for this type of game. There are occasions where particular news beats overlap each other, meaning the coverage wasn’t necessarily 100% related to the announcement of that day. This is particularly true for the Xbox release date announcement and the DOTA 2 Goat video. They happened on the same week, increasing the likelihood that some outlets bundled both stories together into one post. 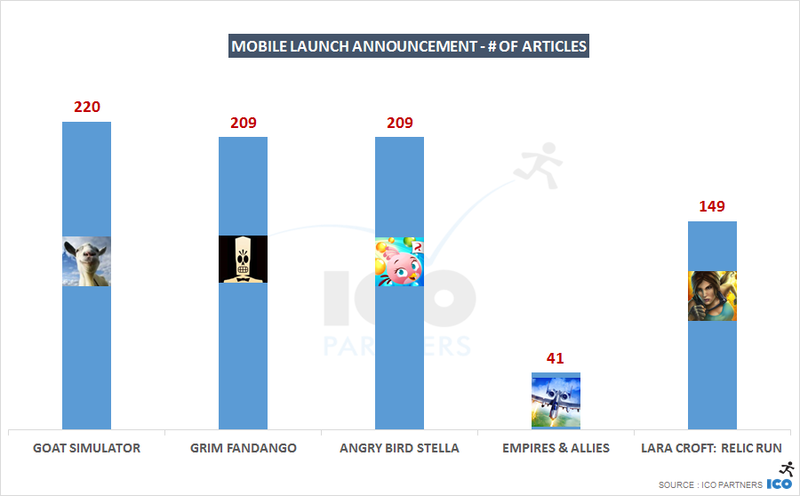 Zynga is far from being a small outfit, and for all that marketing power, they got the least coverage. 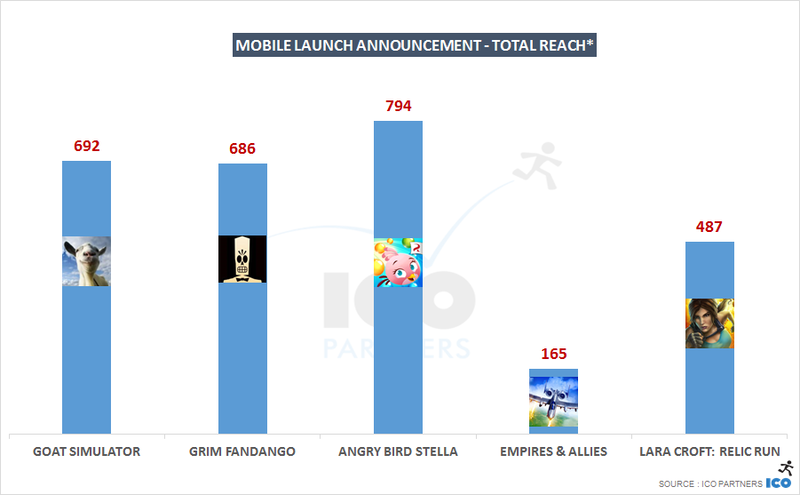 The reach of Angry Bird Stella illustrates that General Interest media (as opposed to Special Interest media dedicated to games) are a strong component of the media covering mobile titles with a strong brand power with the general public. Goat MMO incredibly well covered. 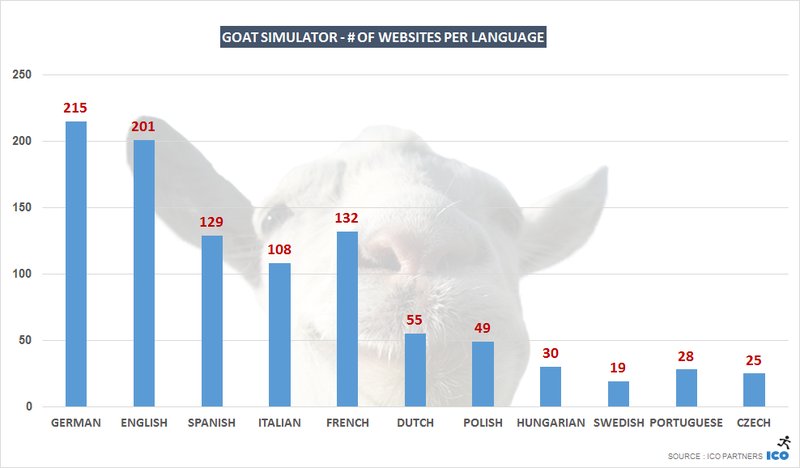 Think what you want of Goat Simulator, they have nailed their positioning. They are funny, don’t take themselves seriously, and it works incredibly well in getting attention. The MMO DLC announcement coverage was just crazy. I suspect a lot of the attention was the social media chatter about it, and much of the same can be said about the launch trailer. This said, there was also a number of MMO-only media which had never covered Goat Simulator who did cover this story, adding to the echo effect. Get the goat inside DOTA 2 community video. Coffee Stain called on their fans to vote for their initiative to add the goat as an official new content for DOTA 2, through the game’s Steam Workshop. From what I saw, this was purely driven through the studio sharing the video and pitching this idea to the community. The video went viral and received massive media coverage, Coffee Stain had again capitalised on the notoriety it had built up with previous beats. With regards to reach*, it was the story that got the best average reach per article, meaning this wasn’t just covered by smaller websites and less read blogs, but major media took the story and ran with it. 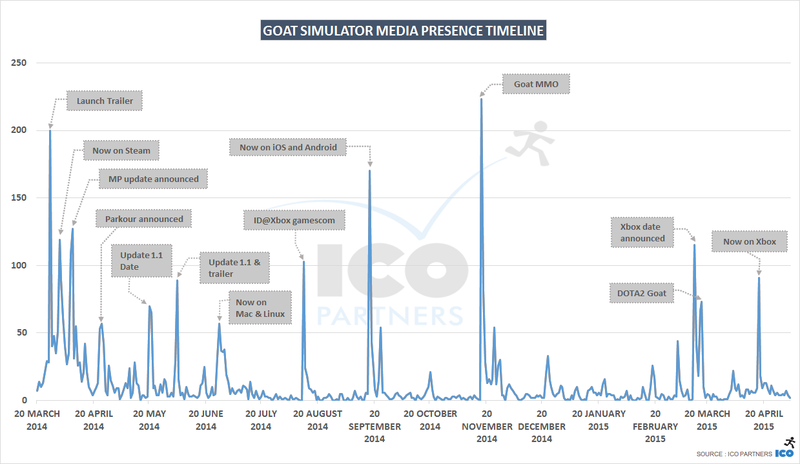 Goat Simulator stays in the news. This isn’t just a communication strategy, but also a development plan. Coffee Stain are forging a growing reputation for having a consistent ability to stay in the news. 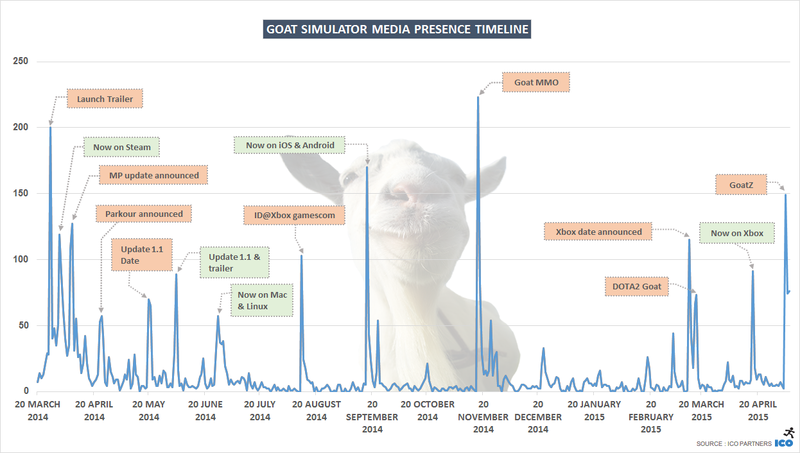 In just over a year, there are only two periods longer than a month or so without some form of Goat Simulator news. Those periods being in October 2014 (which is a busy period and not as easy to be present); and from end of November 2014 to March 2015. Pacing the delivery of messaging to make regular spikes in coverage is a pattern that we regularly see paying off. Of course, media presence is not the end all component of the communication for a game. Discussing with Armin Ibrisagic (@Arminposts) who handles all things communication at Coffee Stain Studios, he did point out to me that for instance, while the Goat MMO announcement got more widely covered than the launch trailer in the media, the respective videos tell a different story. The launch trailer has 7.6m views while the Goat MMO video has “only” 1m views. 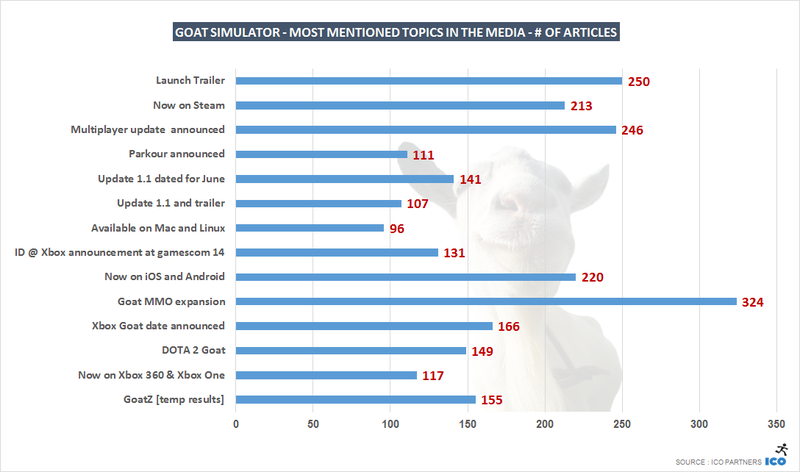 These graphs represent the total number of articles and the total number of unique websites mentioning Goat Simulator during the period studied. For the sake of readability, not all languages that we track are represented here. From the above we can see that despite France having the 3rd largest volume of unique websites, its number of articles put the language in 5th place. There are a lot more articles per site occurring in Spanish and Italian than in French. In the same way, the number of articles per unique website is bigger in German than it is in English, across a similar number of websites. I haven’t explored the country data in enough depth across all the games we are tracking to offer a good overview yet, but what this highlights already is that each country has a very different media landscape. France, while being a key country in Europe, doesn’t have the volume of websites Germany does. 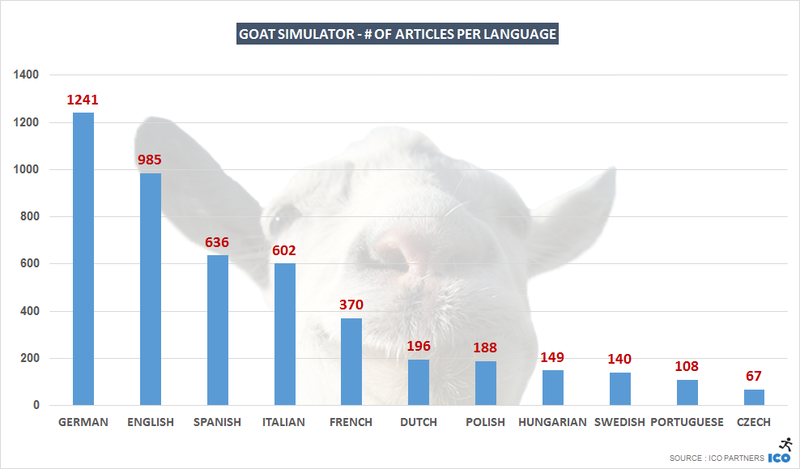 The different behaviour across large Western territories in covering news is also noticeable – France had on average 3 articles per website on Goat Simulator, as opposed to 5 or 6 articles on average in the other languages. Next on the series will likely be Deus Ex: Mankind Divided. Deus Ex is probably one of the most covered game announcement since I started tracking: 1000+ articles. For comparison Overwatch was 900. 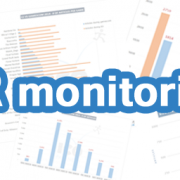 * Methodology reminder: For more details on the methodology and the way the tool we are using is working, check the dedicated blog post.